Posted on September 14, 2018 by revivewa	in Opinion, Reviews. The Roe 8 Highway extension and the related Perth Freight Link was a hugely contentious public issue in the lead-up to the 2017 WA State election. Never Again outlines, purely from the perspective of the project’s detractors, the reasons why they believe it should never have happened and, as the title suggests, why it should never happen again. 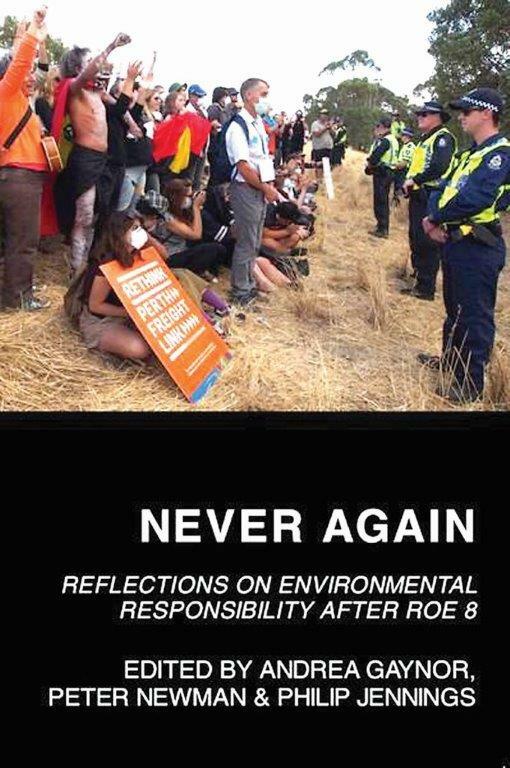 Whilst it is narrowly focussed on the Roe 8 project, the implications of the discussion broaden its scope. Significant questions (and solutions) are raised about the state of our democratic processes, transport planning, environmental protection and respect for Aboriginal culture and heritage. Some of the chapters, contributed by an impressive array of leading academics, give serious pause for thought across all of these issues. There is also an account of activist strategies, legal proceedings and citizen wildlife monitoring revealing how politicised the project became. Importantly, effort is given to capturing some of the cultural and spiritual significance of the Beeliar wetlands through poems, photos and a chapter from retired Uniting Church WA minister, Rev Sealin Garlett. This was the basis for the Uniting Church’s involvement in the campaign. Sometimes the ancient and unseen is more valuable than any economic and political push for bigger, faster ‘development’. With Perth and its surrounds continuing to expand – in what is a unique and fragile environment – tension points like Roe 8 will continue to emerge. As Never Again suggests, a new approach to designing our city must be considered that fits the research, the environment, the cultural history and the needs of a growing city in a transparent way.